I have always felt that my bullet journal is a reflection of my life as a whole. I write about the things I value the most and don’t want to forget. Basically, if I don’t have time for something in my day to day life, its place in my bullet journal is either small or incomplete. I find it’s a pretty good gauge of what I’ve been focusing on and valuing. So, over the past few months I’ve really been yearning to gain a better relationship with God and that means I want to incorporate my relationship with him into my bullet journal more frequently and with better consistency. 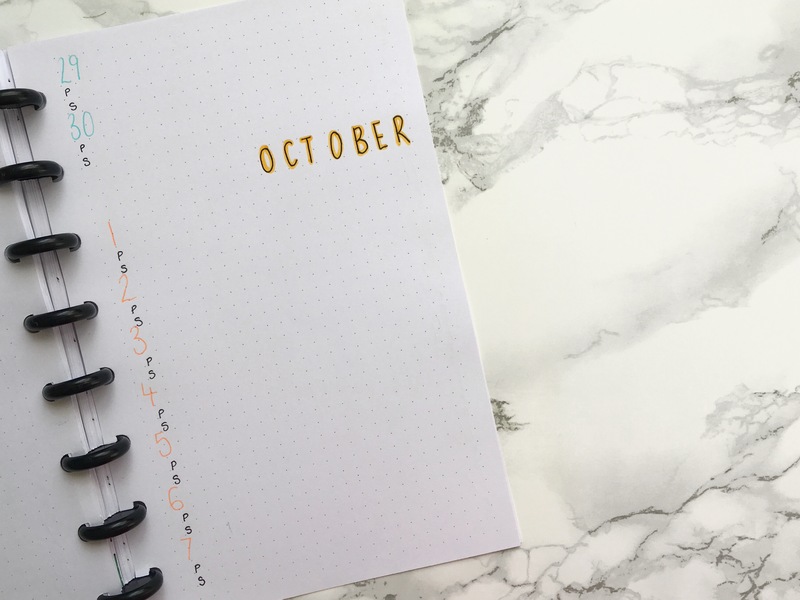 So today, I’m going to share with you all 5 things I do in the ‘faith’ tab of my discbound billet journal that help me grow in my relationship with God and allow me to make more time with him over the course of the day/week. 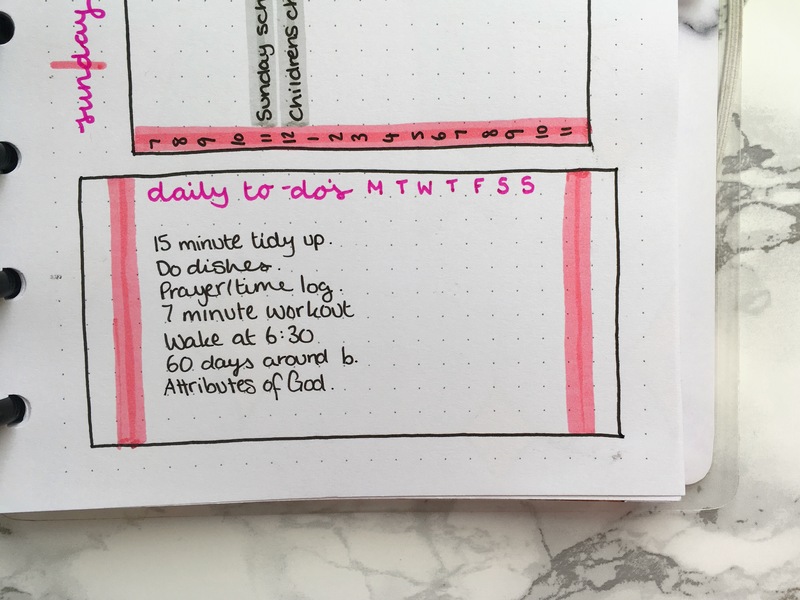 This is by far the simplest way of incorporating your faith into your bullet journal that you ever will see. This spread takes no time to set up, and can be filled out everyday in less than a minute. You can do it in bed, on the bus, with a cup of tea, it’s easy to fit it in! I based this spread on the simple TTPS prayer format that we use with the kids in Sunday School, it’s a very basic mould, but it can also be very powerful. Each day I write down two things I’m thankful for (meaning it doubles as a sort of gratitude log), 1 thing I’d like to ask for (usually not for myself but for a friend, family member or the world as a whole) and one thing that I’m sorry about. Not only does this mean that I have a record of which days I’ve prayed and which days I haven’t, but it also means I can look back and see all the blessings God has given me, and all the prayers he has answered. This is by far the best thing I do in my bullet journal, and it’s also the simplest, least arty spread I’ve ever stuck with. On a Sunday, when I’m sitting in my pew at church, I crack open my bullet journal and I make notes during the sermon (similar to what I do in university lectures). As I’m a visual learner, not only does this mean I can reference the sermon later if I want to revisit it, but it has also majorly helped with my concentration… I actually hear every word the minister says now, no more zoning out for me! I will be honest, I did get a few funny looks the first couple of times I did this, but now I couldn’t be happier and everyone seems to have caught on to what I’m doing it for. 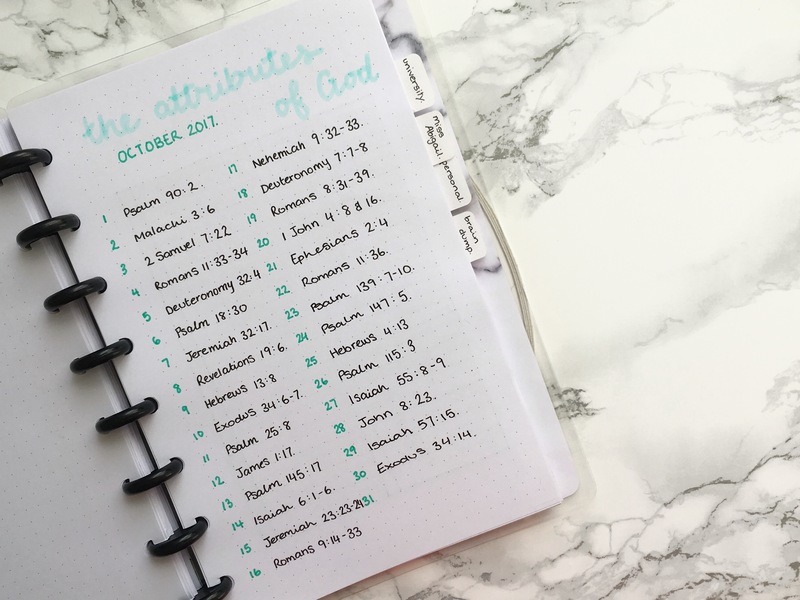 In my habit trackers, I always like to put in a few things I have to do for my spiritual wellbeing as well as my general health and housekeeping tasks. At the moment you’ll see I have tasks for my prayer log, reading my bible and scripture writing, but there are definitely more things I could add in the future. I found this challenge, created by gracesisterhood.com, on Pinterest and really wanted to pick it up myself. 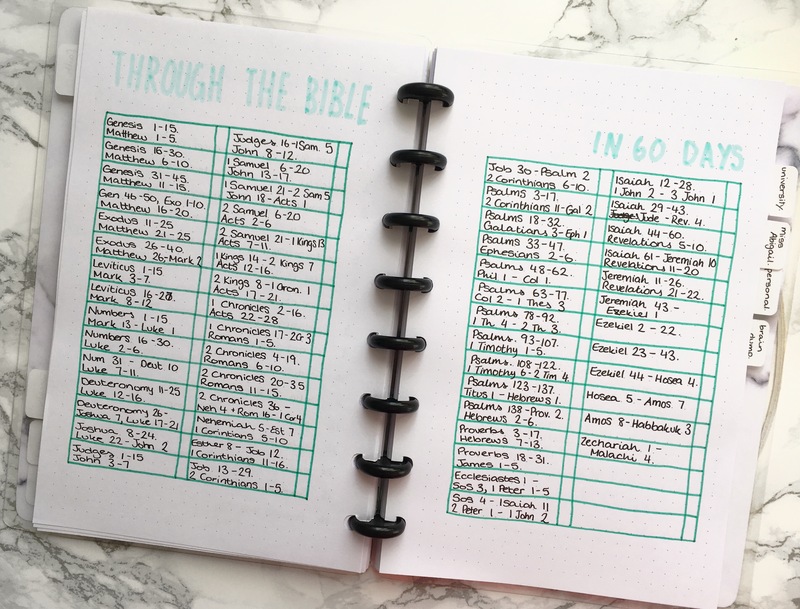 Essentially, it gives you a 60 day plan in which you can get through the whole bible with a section from both the old and new testament every day. I’d really like to try and do this by the end of the year, if I start now I should have just enough time, but I’ll keep you posted! This was another Pinterest find courtesy of wholemagazine.org. Each day, they select a verse or two from the bible that you can write out in calligraphy or other hand-lettering fonts. By writing it out yourself, it helps with memory and also gives you lots of time to reflect on the verse in question as you write, it’s almost like a form of meditation. You could easily do this all on one page, having a page of verses at the end of the month to look back on, or (if it’s a verse that really speaks to you) it could take up an entire page itself. It’s a really nice way of combining your creativity with your faith, it’s very inspiring! 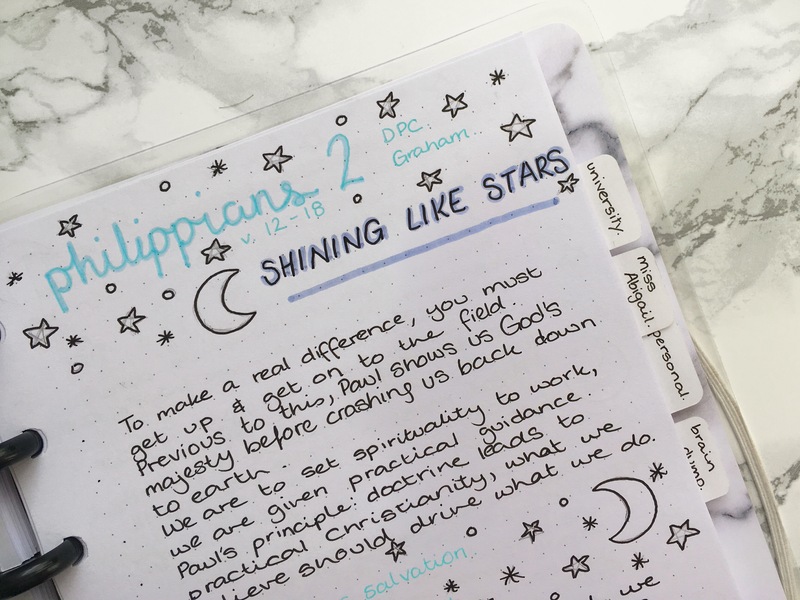 And there you have it, 5 ways to incorporate your faith into your bullet journal. I’d love to hear how you guys show your faith through your bullet journal, I’m always looking for new ways to bring God into my daily life. Leave me a comment down below!